We are going back to our roots with a franchise I have been playing for for over two decades now across a handful of gaming consoles. The game at hand is Castlevania Lord of Shadows Mirror of Fate for the 3DS, and the whip wielding vampire slayer is back, this time 25 years later than where Lord of Shadows left off, focusing on Gabriel’s descendants and their fates. We are talking serious family showdown here and not the Family Feud kind, with the obligatory Belmont family history lessons and uncovering why those cursed Belmont’s must atone the sins of the father. In Lord of Shadows Mirror of Fate, throughout the story, you will play as numerous characters, Simon and Trevor being just a couple. Along with playing as multiple Belmont’s, skills are also passed through the lineage onto the next descendant, on top of new moves and combos with each level increase. I have always been a huge fan of Symphony of the Night and all of the portable entries that followed. When the 3DS version was announced with a storyline the follows the surprisingly great Lord of Shadows, I was plain giddy. In terms of what stands out most to me, it is a tough call, as a fan of the majority of Castlevania titles, I loved the story. On top of a good story though, we also got a good looking and fluid gameplay, similar to that of the recent console version. It was not like the previous GBA and DS versions of Castlevania past, but looked more like Lord of Shadows on a 2D platformer and had the action elements to match. Lastly, the 3D looks great, while most games on the multidimensional handheld add little depth with the visual features, this title was a superb fit to show off the visual feature in the many environments. 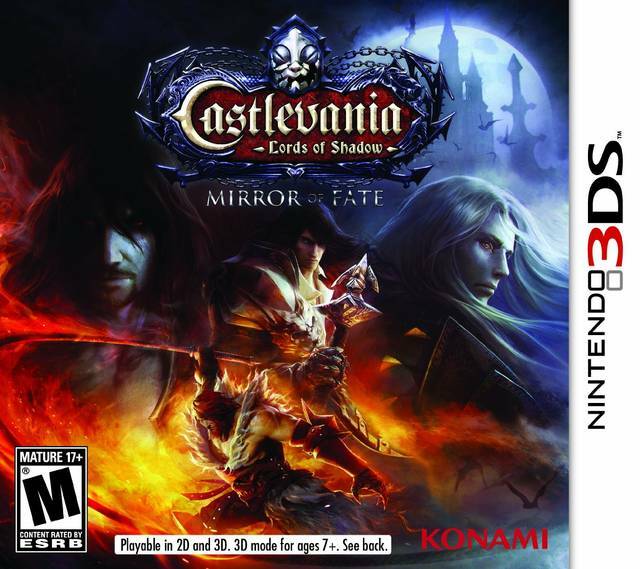 While I did thoroughly enjoy playing Mirror of Fate, it was also not the Castlevania I was hoping for. I was so greatly looking forward to the action RPG platformer Konami has previously provided to Gameboys of generations past. The quick time events did a spectacular job of frustrating me throughout gameplay by occurring far too often. There just was not that need to explore every inch of this game’s castle, making playthrough faster than I would have preferred. Lastly, it is a bit short, between 15 and 20 hours, with the numerous times I died. While Lord of Shadows Mirror of Fate was not exactly the title I was hoping to play, it was a game I enjoyed playing from start to finish. The gameplay was fast and responsive for the technical combo user and button mashers alike. This was a great execution of the 3D, although it did provide eye strain after about fifteen minutes and I often times just turned it off instead of taking a break. As a huge fan of the series, the story was entertaining and flowed well from start to finish. It was about time to get my Belmont fix but next time can we please have the action RPG that takes a lot longer to play through?